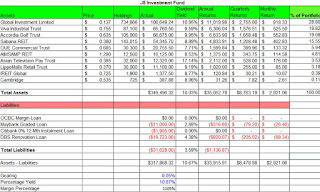 I am updating my investments on this blog which is quite sad for me because of one of the counters. Here it is. I increased my shareholdings just before their announcement of their rights issue which is quite a surprise. I increased it from 41,000 to 101,000 at $0.515 which means currently I am staring at $10,000 paper loss. I am very sad because of the timing which is so bad which resulted in this paper loss here. Rights issue will help me with about $5,000 in paper gain but it is still not enough. Will be subscribing to it and applying for excess to minimise losses. 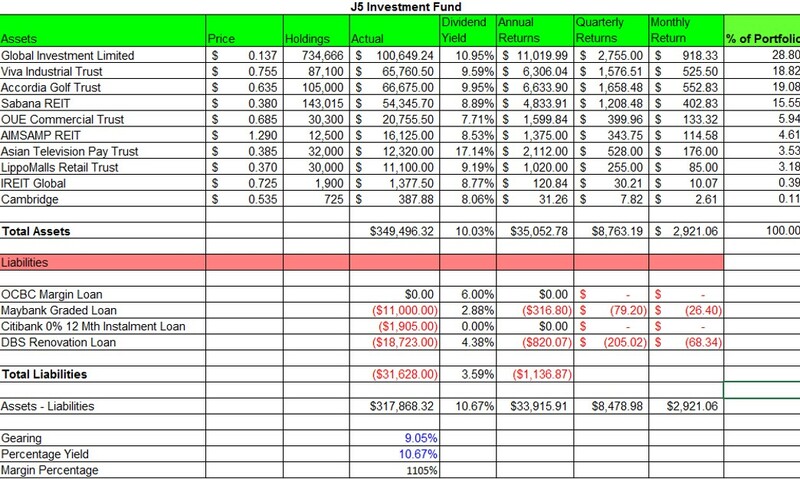 I restarted my investments in Accordia Golf Trust, putting in 100,000 shares at average price of $0.6275 as their dividend yield is still relatively high at close to 10% and trading at discount to NAV. It is going to add to my passive income. Well, since I have excess cash now and investing in them, here is the portfolio which I am having and the passive income which I am getting for me and my family. This is another way of looking at my portfolio. It took years to grow into this and I am really thankful that it is now a significant source of income to my family. Hello so your total asset is 856k or 349k? wow, higher leverage now, not going to be easy if shares price not sable..
Hi, Accordia is a counter who highly depend on Japan currency. Now the Yen is not that strong. Further more, the income is highly depend on weather. U need to becaful. I loss some money in this counter. Just my 2 cents. I read a lot from your blog. I noticed that u always like to buy REIT in discount based on NAV. Is good but also some danger in it. Sabana is one of the example. When some of the REIT is heavily under discount, they may have some underlying reasons such as bad management or bad economy and etc. Just a bit of what I thought here so please don't feel offended. Whilst I understand that the high dividend is a significant source of income for your family, I think you may need to further analyze on some of the companies you are holding. A few of your top there such as GIL, APTT and Sabana have reasons why they are dropping to such price and it is not purely because of general weakness alone but presented by the weakness in their respective fundamentals. That's just my thought on it that we need to look more beyond simply the dividend yield and the discount to nav which I think you invest based on these two metrics most reliant on. first time encountering rights issue for me. How do I go about subscribing to my rights? Thanks! After receiving your letter, you can go to ATM to do your subscription. Ya, APPT and Sabana seem to unsustainable in paying out dividend on the long run. Look at the share prices which are sliding away. Just wondering..So are you going to pick up the rights or stay put ? Wondering..Are you going to pick up the rights or stay put ?